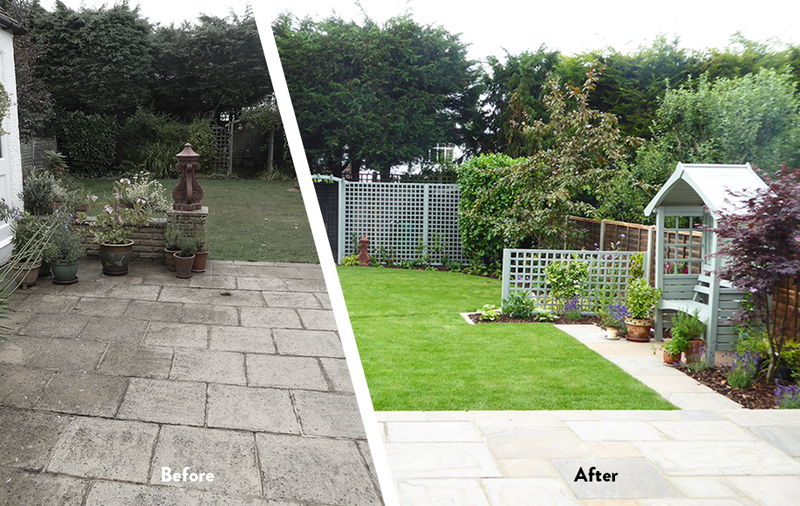 The brief for this tired-looking rear garden included the use of bold, unfussy shapes, using natural materials and softened by planting. Most of the plants were to be removed, but there should be screening to the boundaries and interest within the garden. The circular and rectangular lawns made the site look much larger, and allowed generous planting which included shrubs that will eventually screen the garden and add privacy. The arbour and arch were painted to match the trellis, providing focal points within the design and supporting the vertical growth of fragrant climbers such as the Star jasmine, Trachelospermum jasminoides, and Clematis montana ‘Mayleen’. A treasured fig tree was planted in front of the newly painted white wall. The plinth placed behind the arch awaits a piece of sculpture which will be seen from the kitchen window; always such an important view!